How to design your own backyard? How to design a backyard makeover? Who can design my backyard? Professional landscaping design is all about reimagining the existing space by incorporating diverse elements into it. Allow us to turn the mundane San Diego outdoor living into everyday daylight that you and your friends and family can thoroughly enjoy. Besides, an intricately designed garden is not only about a perfectly-kempt lawn and minimal care. It’s time to make the most of what life has to offer. And if you live in the fantastic city of San Diego, there’s plenty of landscaping design ideas to draw inspiration from. Whether you want to bring more spice into those summer nights under the open sky or simply have a yard that you’ll love spending time in year-round, Pacific Dreamscapes makes dreams a reality. Let the stunning, show-stopping features of San Diego inspire you as you go about reimagining your landscape. For instance, visit the one-of-a-kind Japanese Friendship Garden and implement the borrowed scenery principle when designing your own landscape. It is time for nature and art to act in unison, creating a magnificent landscaping display. And we have what it takes to bring your ideas to life! What sets Pacific Dreamscapes apart from the rest? From extraordinary modern landscape design in San Diego to drought tolerant landscape design San Diego homes so often need, you can rely on Pacific Dreamscapes to deliver. In an effort to meet all of our clients’ requests, we are flawlessly detail-oriented. We’ll go all out to give you the meticulously created landscape of your dreams. Designing from scratch or introducing extravagant upgrades? We do it all. To build a base of loyal clients, be their business or home owners, we move Heaven and Earth to fulfil their landscaping design fantasies. In addition to competitive pricing, we offer free-of-charge landscape design estimates for all our services and remain at your disposal for as long as you may need us. What’s more, you can rely on our impeccable services to boost the value of your property! What good is a lush, picture-perfect lawn if it requires strenuous work to maintain? What is the point of water features that are diametrically opposite to the rest of the scenery? Exactly. What you need is an easy-maintenance landscape that can complement your property and that will not lose any of its appeal for a long time to come. Most importantly, you want your backyard design to be special and unique. That is where professionals come in. As easy as 1, 2, 3: design… build… maintain. Your home or business can now leave an impression that will wow anyone who walks through the door. The process is simple: you tell us what you have envisioned and we will do the rest. We have the experience and the expertise to give you the most superior quality landscape design in San Diego County. There is no reason to feel stuck with a backyard you dislike. Our business philosophy is fairly simple and straightforward: we go above and beyond to give our clients the outdoor living environment they desire, even if it requires an extreme makeover. To deliver flawless results, we take the time and all the necessary steps to create the ideal landscape our clients have envisioned. We want what we build to last and have value. Nothing like exceptional water features accentuated by outdoor lighting to make your landscape design stand out. Let’s celebrate who we are with features such as Koi ponds, backyard waterfalls, garden fountains and artificial streams. We proudly use high-quality Aquascape products to enhance the beauty of your space. We can also design and build garden bridges over water features or dry beds to add an exciting new dimension to any size property. Or how about a wall fountain on one of our wooden decks or patios to soothe daily stress? We can design a patio that is both exciting and practical. Whether you want an outdoor kitchen, pizza oven or a custom built barbecue, you’ve got it. Add the timeless elegance of pergolas and patio covers for all-season comfort. Pavers and decorative concrete landscaping designs are touches that are both practical and stunning. To add privacy and definition to different areas, we build custom walls, gazebos, and landscaping with rocks. 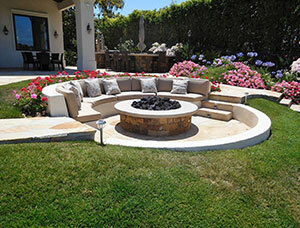 Custom landscape design in San Diego has something for everyone! Plant designs, brand new turf or other enhancements? Not a problem. Perk up your humdrum, tired-looking backyard in dire need of a fresh look! Save precious water with irrigation systems that deliver exactly what each species needs. We can retrofit, add, or remove sprinkler zones for the perfect setup. We can add dramatic outdoor lighting with both conventional, low-voltage and solar light bulbs. Xeriscapes is about using native and climate-friendly plants helps you beat the high cost of water and do your part for our drought-prone environment. Xeriscapes can be very beautiful and need very little maintenance. Lately, landscaping design in San Diego County can hardly do without xeriscapes. In the right hands, boulders, stones and pebbles create a low-maintenance, highly appealing backdrop. They look natural with low-water plants such as succulents and cactus. We source ours from KRC Rock and Boulder, a leading name in the area. Our team can! Not only do we specialize in custom landscape design in San Diego, but also use only the best materials in everything we do. You will work with specialists in each facet of the trade such as landscaping, carpentry, lawn and garden care, outdoor lighting, irrigation and concrete landscaping designs. There will be no cookie-cutter look for your landscape! We treat your yard like a blank canvas to be transformed into an inspired space you will enjoy every day. For a small fee, we’ll also do an in-depth analysis of your landscape, irrigation design and trees, as well as plant identification and care. Call our landscaping design team at 858-583-4105. We are members of the BBB (A+ rated) and service all of San Diego County.